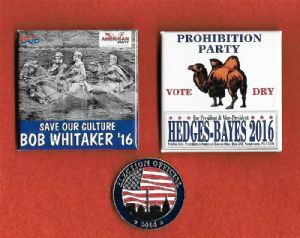 The 2016 American Freedom Party presidential campaign button displayed here, which was purchased online, identifies Bob Whitaker as its presidential candidate. Whitaker, who coined the phrase, “White Genocide” when referencing America’s declining white population, had accepted the Presidential nomination of the American Freedom Party (AFP) in July 2015. The AFP, which was founded in 2010, seeks to promote the “customs and heritage of the European American people,” defend America’s borders, preserve America’s language and culture and supports the right to keep and bear arms. Whitaker withdrew from the AFP ticket in April 2016 and decided to run as an Independent. This was because he felt the AFP was moderating in its views and was leaning toward supporting Donald Trump, the Republican candidate. Whitaker was replaced as the AFP 2016 presidential candidate by Tom Bowie. The image on the button depicts the Confederate Memorial Carving located in Stone Mountain, Georgia. It is the largest bas-relief sculpture in the world and features three Confederate heroes of the Civil War, President Jefferson Davis, General Robert E. Lee and Thomas J. "Stonewall" Jackson. James "Jim" Hedges was selected as the Prohibition Party's 2016 Presidential nominee in July 2015. A long-time Prohibition Party activist, Hedges is the only Prohibition Party candidate to win public office in the 21st century, this being the office of Tax Assessor for Thompson Township, Pennsylvania where he served from 2002 to 2007. The Prohibition Party was founded in 1869, and is basically against the sale and consumption of alcohol. A highlight of the prohibition movement came with the passage of the 18th Amendment to the U.S. Constitution in 1919 which made the production, sale, transport, import and export of alcohol illegal. Prohibition was repealed in 1933 with the passage of the 21st Amendment. The 2016 Election Official pin was provided to Allegany County election judges on the day of the April 26, 2016 Primary Election. This particular pin was given to Albert L. Feldstein who served as Chief Election Judge at Election District 29, Precinct 3 in LaVale, Maryland. The American Party was established in 1969. It was an outgrowth of and formed from the parties that supported George C. Wallace during his 1968 campaign for president. At that time he ran as the nominee of the American Independent Party. The American Party adheres to a set of conservative “Permanent Principles” which was established at its founding. It should not be confused with the American Freedom Party.